Kenneth W. Howell is an assistant professor at Prairie View A&M University. He received his Ph.D. in history form Texas A&M University and also taught there as a visiting assistant professor. He is the author ofTexas Confederate,Reconstruction Governor: James Webb Throckmortonand coauthor ofThe Devil’s Triangle: Ben Bickerstaff, Northeast Texans, and the War of Reconstruction inTexasandBeyond Myths and Legends:ANarrative History of Texas. What Is CBM and Why Should I Do It? Why Were the Other Attributes, Like the Timing and Charting, Developed? 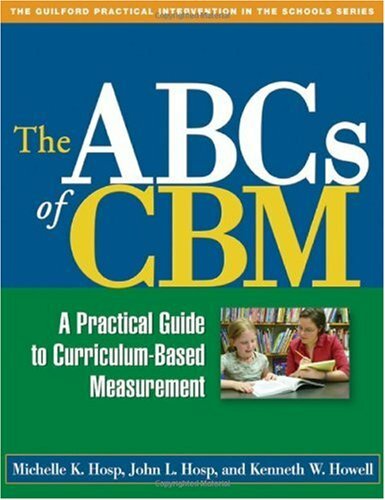 How Is CBM Different from Other Forms of Measurement? What Are the Main Advantages of CBM? What Kind of Decisions Can I Make with CBM Data? How Does CBM Relate to RTI? So CBM Does Just About Everything? Are There Different Types of CBM? I Have Never Seen CBM Being Used. If It's So Great, Why Isn't It More Popular? Is CBM Used in Special Education or General Education? If I Want to Use CBM, Does This Mean I'll Need to Make Tests Out of the Instructional Materials I'm Using? Where Do I Get CBM Materials? What Do I Need to Know about Educational Decision Making? How Reliable and Valid Is CBM? Where Do They Get the Performance Standards Used in CBM? How Can CBM Be Used for Screening/Benchmarking? How Can CBM Be Used for Progress Monitoring? How Often Should ORF and Maze CBM Be Given? How Much Time Does It Take to Administer and Score Reading CBM? How Much Progress Can We Expect in Reading? How Often Should LSF and WIF CBM Be Given? How Much Time Does It Take to Administer and Score Early Reading CBM? How Often Should Spelling CBM Be Given? How Much Time Does It Take to Administer and Score Spelling CBM? How Much Progress Can We Expect in Spelling? How Often Should Writing CBM Be Given? How Much Time Does It Take to Administer and Score Writing CBM? How Often Should Math CBM Be Given? How Much Time Does It Take to Administer and Score Math CBM? How Much Progress Can We Expect in Math? How Often Should Data Be Collected?